Here in the Ozarks, winter weather can be unpredictable. This year, we’ve enjoyed mild weather for the most part with sporadic bouts of bitter cold and some freezing rain. And while this morning’s temperature was in the mid-30s, the rain was cold and edging into icy. 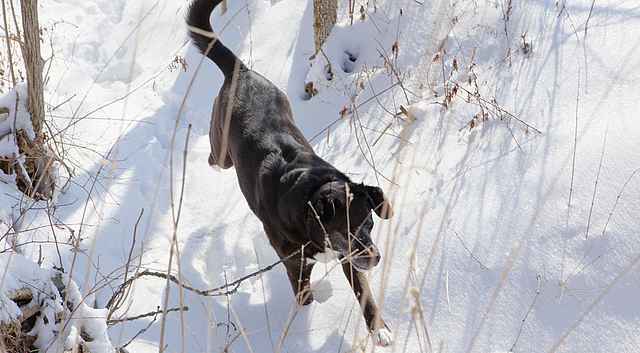 I’ll confess I was sorely tempted to exercise Sasha indoors, but then I remembered reading a terrific post on the Chasing Dog Tales website about the benefits of outdoor exercise in winter. 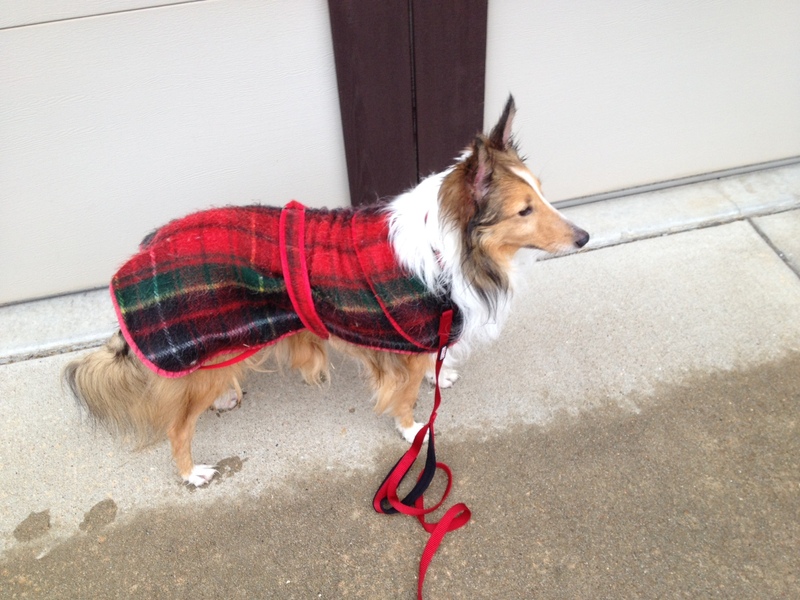 And so off we went, with Sasha proudly sporting her red plaid coat. In addition to keeping her warm, the coat kept most of her dry, making both of us happy! And this Sasha’s very first stand-stay; didn’t she do well? Sasha enjoyed the outing so much I wanted to share the original post. Here it is, reblogged in its entirety courtesy of Elaine Bryant. (Thanks, Elaine!) That website is a wonderful resource, by the way, and I hope you’ll check it out. My thanks to Elaine for allowing me to reblog this post and share her excellent advice. If you’d like more information about helping your dog stay healthy and happy, be sure to check out Chasing Dog Tales. Have more tips and suggestions to help us all enjoy the winter? Leave a comment here! This entry was posted in Dogs!, Home page, Writing and tagged Chasing Dog Tales, Dog Safety, Dogs, fun, tips, Training, winter exercise. Bookmark the permalink. First, Sasha looks awfully cute in her sweater! And a big “good girl” to her for her stay! Great piece, Elaine. 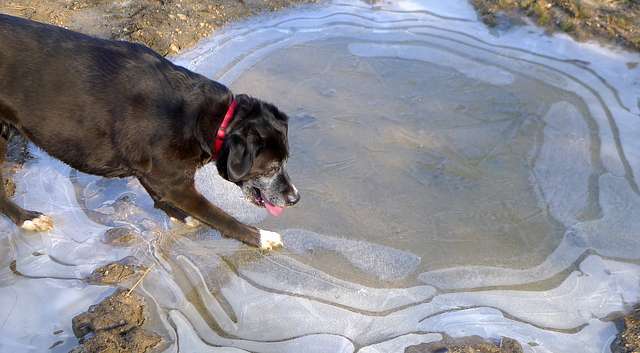 We live in the country where I can have my dog, Shadow, off-leash if the footing is slick, but I think I’m going to invest in a pair of the ice cleats anyway. The fingerless gloves, another great idea, wouldn’t work for me (I think), because in addition to juggling a leash (sometimes) and plastic bags to scoop poop, I’m usually juggling a camera as well. I’m afraid the magnets might hurt the camera, but maybe I’m wrong. I walk pretty much every day, rain or shine, because Shadow is an energetic dog, and because I consider a daily walk my anti-depressant of choice. Neither of us feels good if we miss our walk. If the weather’s truly awful, we’ll usually walk, just to get outside, but shorten it considerably so neither of us gets too cold. Shadow does get horrible ice balls on his feet, and, frankly, all up and down his legs, so that he looks like he’s wearing puffy white leggings. I pull them off the best I can, then bring him in to melt. (In fact, I wrote a short photo-blog about it, “Snow Doodle” http://susankroupa.com/2014/02/16/snowdoodle/ ).